← Try a taste of Kenya! Efo Elegusi soup is a Nigerian dish made from Egusi seeds (melon seeds). There are many different ways people make efo elegusi soup. below is a step by step guide on how i make it. With pictures i took myself while cooking it. You can enlarge each picture by clicking on them. First step! Get all your ingredients at the ready. 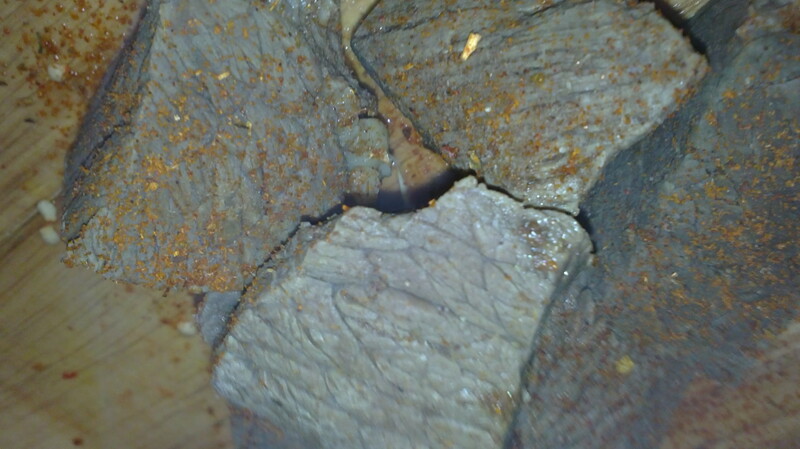 While you are preparing Preparing your soup it is best to cook your beef during this time (or fish, what ever you choose to use, i chose beef 🙂 cook it very well and season very well. How you like your meat is up to you though. I personally like to boil it for a hour or more so it is soft and well done. Put your spinach aside for later. Most people add their spinach to the soup raw without cooking first, but my hubby and i like our spinach well done so i cook it in a pot of water for a minuet or so and add it to the soup last. Next get you Egusi seeds. Add them to your blender or if you are using a hand blender like i do, Add them to a deep container and blend them very very well so that no part of the seed is whole. It should be very powdery and not lumpy. As you can see below. Now get one onion and chop it and add it to your blender or deep container (for hand blending) and add just a little water, about half a cup. 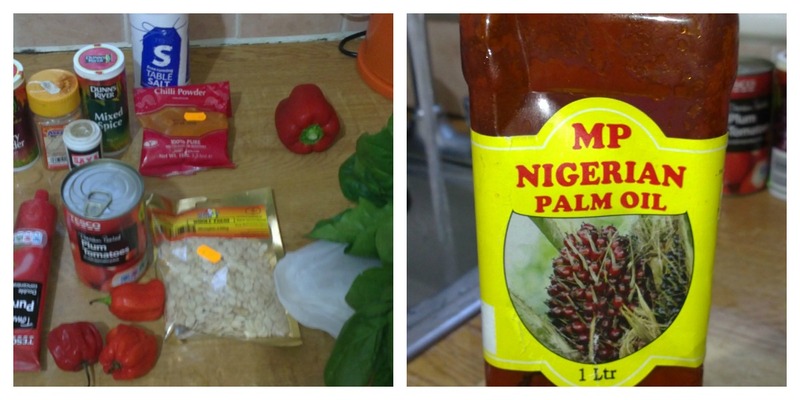 Now blend up and add this onion’y water to your egusi. 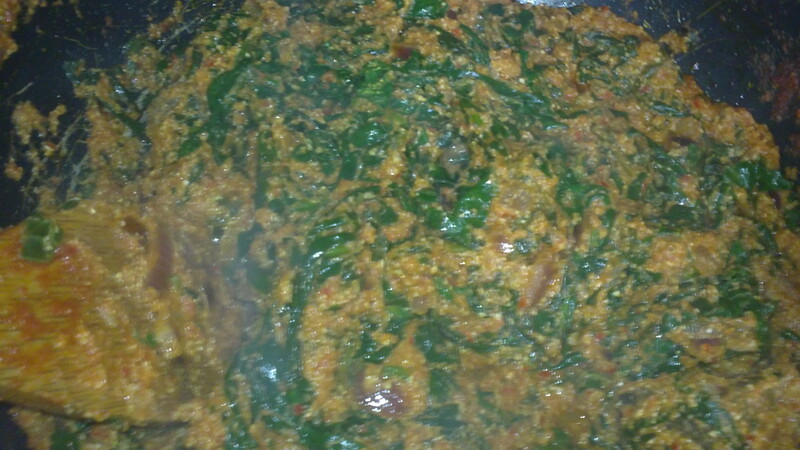 mix together until your egusi looks like a kinda paste. Now get your Red pepper and 2 chili peppers. cut up into fine pieces and add to blender or deep container. Also add you can of tomatoes. Chop a onion and add this to the blender also. Now blend it all together and sit aside for later. Now get a large pot or pan and add about 2 table spoons of palm oil. you can add more or less. depends how oily you like it. Now add 1 chopped onion and allow to fry for about 3 minuets or so. When the onions are browned, Add your blended peppers/tomatoes into the pot. Allow to simmer for a few moments. Now add 2 table spoons of chili powder and 1 table spoon of mixed spices. 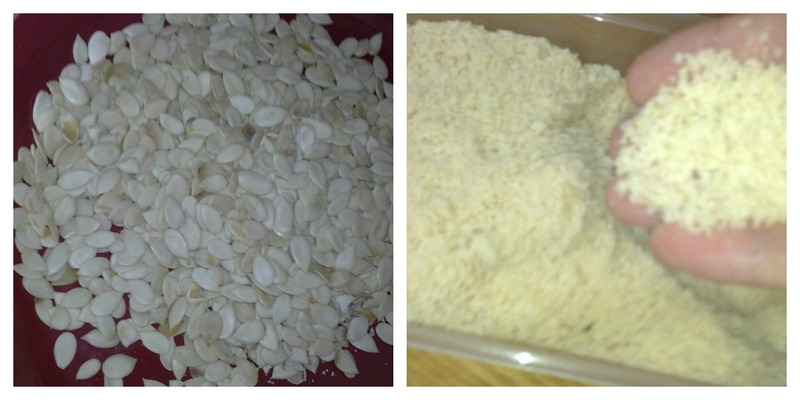 Add 2 table spoons of salt and 1 crumbled up stock cube..
Now get you Egusi mix and scoop it into the soup. You dont need to mix it all through. Just scoop onto the top of the soup like below. When you cover the pot to cook it will spread through the soup on its own. Now start adding your spinach and leave to simmer for 5 minuets before checking on it. Next add your beef, some people add the beef before the spinach. I personally dont as i like the spinach to really cook well in the soup. Now leave for a further 15 minuet to allow the beef to flavor in the soup. Keep checking on it to assure it is not burning :p hopefully it should now look like the picture below. 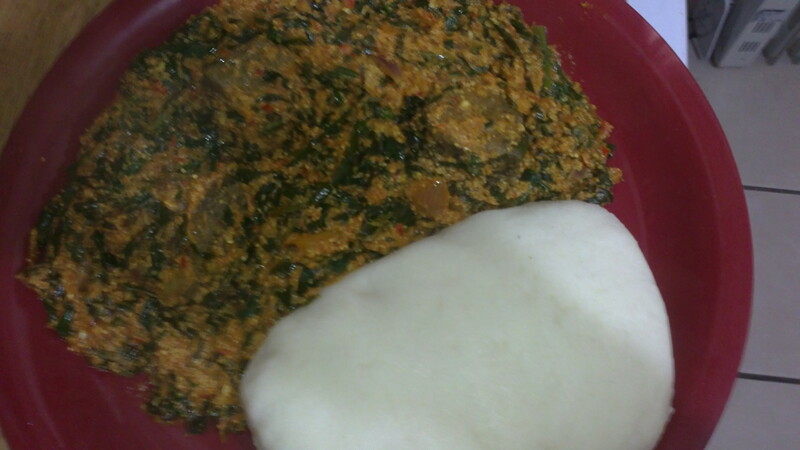 Now for the pounded yam. If you are using powdered yam., need i tell you how to make it? haha it is very simple, boil water very well add add the powdered yam bit by bit and mix mix mix till it is smooth and no lumps. Press against side of pot to reduce the lumps. First of all, peel your yam and cut into cubes or chunks. Boil in your pot for roughly 30 minuets. keep checking to see when if is soft enough for pounding. Pierce with a fork to know how soft it is. When it is done, Add the Yam chunks to your Mortar and use the pestle to mash it up (pound) continue like this for as long as it take lol keep pounding and get all the lumps out until it is smooth and has a nice texture. 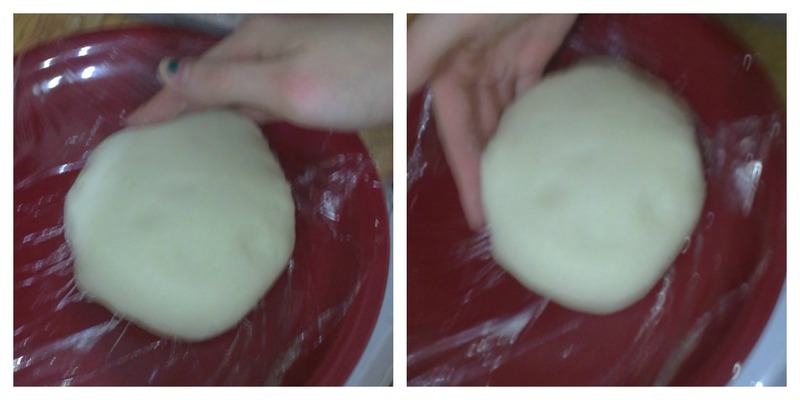 Now lay your pounded yam onto a plate with Cling film on the plate, You will now shape the yam with your hands. Wet you your hand first and now start shaping it to make it more smooth and look better! Wrap your yam in clingfilm to keep its shape or to keep it warm for longer, if you wanna eat it right away then you dont really need to wrap it in cling film. Now plate up you Efo Elegusi and pounded yam and enjoy! It should look like my pic below if you have followed my steps correctly 🙂 Dont forget to wash your hands before eating hehe. This entry was posted in Nigerian food, Recipes and tagged Africa, Cooking, Egusi Soup, Nigeria, Nigerian Food, Pounded Yam. Bookmark the permalink. I’m going to try your recipe. Thanks for sharing. amazing!! I am nigerian and i must say your husband is lucky to have someone like you so willing to adapt to his culture. Ku ise o.
sincerely i am so happy reading your post,you make me feel great being a Nigerian.Thanks for loving our yoruba culture…I love many cultures too..
no, Thank you dear! I’m glad you enjoy my posts. Thanks for reading!